On 21 April 2016, we co-presented the Donald Broadbent lecture at Ergonomics and Human Factors 2016 (Daventry, UK) summarising some of the themes in ‘Human Factors and Ergonomics in Practice’. In this post, we summarise aspects of the book, slide by slide, with a grateful acknowledgement to every author who collaborated. This lecture is about the messy world in which we live, and how this affects human factors and ergonomics in practice. 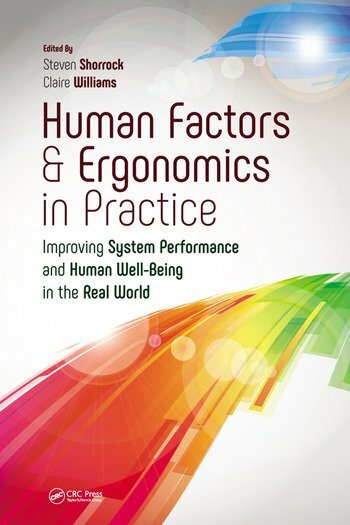 The lecture material is derived from a book that we have edited called ‘Ergonomics and Human Factors in Practice: Improving Performance and Wellbeing in the Real World’, to be published by CRC Press in Summer-Autumn 2016. Slide 2 – How do practitioners really work? We met about ten years ago, at this conference, when we were presenting papers on issues of practice. We had both been practitioners for about ten years at that time, and were beginning to realise HF/E professionals did not talk much about the reality of practice. We wondered, where could we discuss and hear about lessons learned and not learned, day-to-day, in HF/E practice? What aspects of context and the systems in which we worked drove ‘success’ and ‘failure’? In reality, what was practice really like in terms of the compromises practitioners had to make? What were the wider implications of and for practice? Where were the stories about practice? Fast forward about eight years, and the idea we’d been thinking about, to bring together the stories of practice into a book was ‘spoken out loud’ by Steve. I didn’t have the good sense to question how we might manage it, with full time jobs, young families and plenty of additional draws on our time. We embarked on the project from this single idea; which has taken thousands of hours and emails; seen the drinking of hundreds of coffees and glasses of wine; and resulted in over 300 pages, covering more than 20 industries, in 31 chapters, by 48 authors. Forty eight authors wrote chapters for the book, and a similar number of people contributed with reflections and comments [on this blog]. The people span all sorts of organisations – consultancies, manufacturers, service providers, government organisations and universities. This presentation is our chance to celebrate and honour the contributors to this book. So what do we mean by a messy world? Let’s take a look. Human factors and ergonomics is influenced by, and influences, a wider context of messy organisational, industrial, technical, economic, societal, political and legal factors. These interact in many ways. Organisations, and the people associated with them, are influenced by the economy, the law, the media, technical developments, and society, for instance. Everything is connected to everything else in some way. Practitioners of human factors and ergonomics, and others who design or influence interactions in some way or other, also influence these things, sometimes in ways that we don’t expect or realise. The context of those interactions is of course influenced by the interactions, and creates what might be called a mess. Russell Ackoff defined a mess as a ‘system of problems’ – interconnected problems – but we would add some of the following: goal conflicts, multiple constraints (social, economic, legal, technical, etc), unknown interactions, uncertain and unique situations, a fast-changing, unstable, turbulent environments and problems, which are hard to analyse and understand, and have no obvious solutions. Let’s zoom in to take a look at some sources of organisation mess, and more generally some sources of diversity that human factors and ergonomics practitioners have observed. In the context of the oil and gas industry, Rob Miles and Ian Randle note the continuous drive to reduce staffing for safety and cost reasons. In healthcare, Ken Catchpole (@KenCatchpole) and Shelly Jeffcott (@drjeffcott) talk about the fact that services are delivered by humans to humans. They talk about a workforce that is highly professionalised, and where people take individual accountability and self-determination very seriously, and also where there are complex relationships between certain roles. In the context of the military aviation, Ben Cook and Ryan Cooper highlight an intelligent, motivated, disciplined and highly trained workforce. In this environment, they say, trust is essential, and trust between the HF/E practitioner and the commander is critical to get improve how things work. Contrast this with agriculture, where Dave O’Neill and Dave Moore note that there is a lack of clarity over who is, and isn’t part of the workforce. In organisations generally, what we see are a number of not uncommon issues. As far as people are concerned, these including variable competency levels, inadequate staffing or rostering, downsizing and precarious employment situations, strained or hostile relationships, little or no involvement in decision making, and sub-culture conflicts. So when we research or practice human factors and ergonomics, we have to be cognisant of the kinds of mess that we might encounter. Some of it will be more obvious, while other sources of mess will only become evident after spending a period of time in the organisation. Unless HF/E interventions take account of factors such as this, they may well be impossible, unsustainable or even counterproductive. Fortunately, HF/E practitioners often have well-trained senses that are adapted to detecting these kinds of issues, and practice skills that help to navigate them. Turning to procedures in organisations, Daniel Hummerdal and Stuart Shirreff wrote about HF/E in construction and demolition. This industry is used to being governed by the rule-book and project delivery contracts, and HF/E is a relatively new field. Our possibilities in this context are limited and we need to be pragmatic. Jean Paries and Brent Hayward note that aviation procedures will be used by people of various backgrounds, experience and cultures from all over the world. Designing procedures for effective use is thus a significant challenge. Ben O’Flanagan (@benoblimey) and Graham Seeley wrote that the rail industry is characterised by rule-base methods of working that tend to have evolved slowly over time. This brings a particular set of constraints for those working in this industry. Web operations and engineering, on the other hand, has no overarching regulatory, standards, or policy-making body for associated services, according to John Allspaw (@allspaw). This brings a different set of challenges for those in the industry, and for HF/E. Again, there is a variety of not uncommon procedural issues that affect people in organisations, and affect the possibilities for HF/E, both as opportunities and constraints. There can be an enormous number of procedures. A major air traffic control tower unit can have over 1000 pages of operational procedures plus tens of temporary and supplementary operating instructions (which can be even worse on the railways). This makes everyday work a challenge. Procedures are often designed from afar – policies almost always – and may not reflect reality. Procedures and work processes are often over- or under-specified. Procedures can be fragile and unworkable in many circumstances, and rules can conflict with each other, placing people in a catch 22. Still, workers are exposed if they stray from the procedure and something goes wrong. There is a lot of basic work to do to rationalise procedures and make them realistic and usable, and we need to understand that procedures are, more often than not, far from optimal. In the context of technology in organisation, what is remarkable is the variety of implications for design, operation and maintenance. John Allspaw remarked that, in web engineering and operations, “automation isn’t just part of it. It is it.” And unlike almost every other field, operators are also frequently the designers of their technical systems. In oil and gas, Rob Miles and Ian Randle said that the design and engineering of new assets is usually contracted out by the operating companies to specialist engineering and construction contractors, who may not receive direct feedback on the success of, or problems with, their previous designs in the field. They noted that most engineers designing the asset will not have worked on or even visited an operating installation, and that this is a barrier to the continuous improvement in design that has been seen in some other industries. In agriculture, Dave O’Neill and Dave Moore raised the issues of the human-animal interface. Dan Jenkins (@danielpjenkins) raised the one-shot nature of consumer products; once they are released to market, it is not possible to modify the design, unlike most other environments in which HF/E practitioners work. In the messy environments in which HF/E practitioners work, we see a variety of not uncommon technology issues. HF/E practitioners in many industries find themselves in environments that are a mix of old, legacy technology, installed over time, and newer technology, both commercial-off-the-shelf (or COTS) and bespoke. COTS software may be amenable to local adaptation (such as colours) but not fundamental change (such as scrolling behaviour), which may well affect the software deployed across several units and organisations. Equipment frequently varies in operation, sometimes in fundamental ways even within the same working environment, such as in hospitals. Some is close to unusable, or in various states of disrepair. Tools may be missing or not fit for purpose, forcing workers to adapt their method of work (‘violate the rules’) to compensate. Spare parts may be lacking; it is not unusual to hear of organisations using eBay to obtain certain parts. Innovation cycles are getting shorter, and equipment is replaced more frequently than before. Consequently, workers (especially technical/maintenance staff) spend much more time in training to understand the technology. Now let’s zoom out a little, starting with technological developments and then more generally. Technology is changing faster than we can prescribe how to use or or to regulate it, and is a source of mess for our HF/E practice. In her Plenary lecture at this conference, Elizabeth Churchill from Google talked about the Internet of Things and the security issues surrounding the interactions between all the devices which are now connected and connecting to one another. Just last week in the UK, we had the first reported impact with a commercial plane by a drone, following a number of ‘near misses’. Technological change is a source of mess, but is also part of a potential route through the mess. Professor the Lord Darzi’s Plenary lecture on innovation highlighted the enormous potential for technology to support better outcomes in healthcare, with the help of HF/E practitioners. Markets are changing. Economic power is shifting away from the traditional ‘western’ centres to the emerging economies of the so-called ‘BRICS’ – Brazil, Russia, India, China and South Africa – though the fragility of this shift is evident with market slow downs in, for example, China. The change in economic power and also in the location of manufacturing means work is less certain and where we work is changing, with potential stakeholders for the work we do spanning many different countries. The financial crises and collapses have impacted whether we have work at all – even at this conference we are missing some normal attendees from the Oil and Gas sector, whose travel budgets are cut due to the incredibly low price of a barrel of oil. And within this uncertain and messy context, there is a compounding factor which makes our work more difficult. In her chapter on User Experience, Lisa Duddington explains that, at the point where you most need a research budget, to solve complex problems in an uncertain world, is the most likely time for that funding to be slashed. Likewise, the big societal issues of our times, provide a messy context of both challenges and opportunities for human factor and ergonomics. Here are just of a few of the issues. Populations and therefore workforces are ageing. This gives an ever opening avenue for user-centred design and considerations of accessibility. Ed Chandler and Phil Day talk about how we should consider this as ‘designing for our future selves’ as we bring HF/E practice to inclusive design. Food provision for the world’s population is and will continue to be a key societal issue, and one which currently occupies around half of the people on earth. Dave O’Neill and Dave Moore outline the diversity and complexity of issues in HF/E in agriculture, yet there is only a handful of HF/E specialists turning their attention to agriculture. This is a resource gap of enormous proportions. So now let’s focus in on how these sources of mess can play out in the specific problems we might face as HF/E practitioners. We’ve chosen one industry, aviation, to seek out some examples. The German Wings tragedy where pilot Andreas Lubitz locked himself into the cockpit and deliberately crashed the plane raises again the issue of how we trade off access with security. The same is true in the aftermath of the Belgian terrorist attacks, where typical questions around the flow of people and the design of the work of those carrying out security checks (typical questions for HF/E practice) are made messy by the unfolding context of new levels of threat and a change to the previous ‘rules of engagement’. Staying with aviation, the Air France crash of Flight 447 is an example of how we must consider how best to ensure the competence of key people, faced with new (and evidently failing) technology in the reality of a time pressured roster and limited training. Time is often of the essence when it comes to decision making, and we have to work to these constraints. When airspace is suddenly closed, through power surges or naturally occurring Volcanic ash clouds, quick answers ago questions bout human performance capabilities may be needed then and there. HF/E practitioners may then need to contribute to longer term consideration of risk and preparedness. And the mess can be further complicated when our ideas and concepts are taken by the media or even the judiciary, and used in ways that oversimplify or worse, work against a systemic understanding of the human in the system. We have used the terms ‘human error’ and ‘situation awareness’ to explain and understand some aspects of what goes on in a system, and they have been taken by others to attribute blame and define causality for some of the incidents we have talked about. It makes our work more messy. So we have seen that there are large scale sources of mess for our work, which include the organisational, economic, societal, technological, political and legal contexts in which we practice. These provide fast changing, turbulent, uncertain situations which in turn mean we face analytically difficult, interconnected problems with unknown interactions and multiple constraints, where the solutions are not obvious and where the goals are often conflicting. If that is the mess in the world around us, what about the mess in the middle – the mess that we bring to our practice? Every discipline and profession has its own mess, us included. Slide 26 – A scientific discipline? Or a design discipline? What kind of discpline are we? There has been much debate over the years about the status is human factors and ergonomics, as science, applied science, engineering, craft and art. Arguments have been made for each and all of these, but it’s time to stop philosophising. The fullness of HF/E – in research and practice – can only be characterised as a dynamic blend of all of them. It is important to recognise, then, that all are necessary and valid, but if we spend all of our time in one mode to the exclusion of others, then we are not being as effective as we could be. For instance, we must not neglect the empirical evidence base behind noise and vibration, but nor must we neglect our experiential evidence base that helps us to make sense of messy problems. Our solutions may be rooted in science or may require art to communicate a message, or both. While HF/E is framed by the IEA as a scientific discipline, it probably makes more sense to frame it as a design discipline, because ultimately HF/E is design-driven. Many of us have draws like this (and certainly not just men…). It’s the drawer where we keep lots of stuff that we don’t properly sort out. In HF/E, we have such a drawer too. We suspect most disciplines and professions have one. Ours includes a confusing identity. We are both ‘human factors’ and ‘ergonomics’, but we also often use the term ‘user centred design’, ‘human factors engineering’, and many in digital services have adapted to ‘user experience’ (and a plethora of other terms). Each of these terms brings connotations. Ergonomics is often associated with physical interactions while human factors is often associated with accidents and accident prevention. And we have a skill gap. We don’t have nearly enough practitioners, nor courses. There is an imbalance in utilisation. In the UK, there are 5-10 times more HF/E specialists in air traffic control (an ultra-safe industry) than in agriculture worldwide. We have ‘competing’ professions in different domains, who usually focus on performance or wellbeing, or the physical or the psychological or the organisational, or a certain industry, with a more limited scope of application. And again we have ambiguous concepts, such as ‘human error’, ‘situational awareness’, ‘mental workload’, and ‘RSI’. We often use these in a different way to common usage. Slide 28 – Ergonomic or not? And we even have different views on the term ‘ergonomic’. In the context of selling ‘ergonomic’ products, Guy Osmond (@OsmondGroup) noted that British ergonomists tend to think that no product can be ergonomic in and of itself – not without context. In the U.S., however, products are routinely described as ‘ergonomic’. This is perhaps a realisation of the marketing value of the term…but this usage can have unwanted consequences when promises do not materialise. As long ago as 1967, Alphonse Chapanis – one of the founders of the HF/E discipline – noted how difficult it was for the ergonomist or human factors engineer to find information that will really contribute to a problem. One friend, on leaving a research position to work in an investigation role, made a similar remark. The problem is likely to be similar now in terms of the percentage of information, because there are now so many more journals and books than ever before. Keeping on top of reading research is more than a full time job in itself. There is often an assumed relationship between research and practice that looks like this. It is known as ‘technical rationality’ and views professional activity as instrumental problem solving made rigorous by the application of scientific theory and technique. Singleton argued that research should inform practice through ecologically valid and usable methodology, and practice should ideally be based on research evidence, and raise more questions for research. This feedback loop is not always present. Schön (1983) critiqued this in 1983 in his book ‘The Reflective Practitioner’. We need an effective research-practice relationship in HF/E. But we also need a relationship that acknowledges the realities of practice. Those employed in universities and those employed outside universities have different goals, by virtue of different reward systems. Researchers have to focus on research funding and publications. Practitioners goals vary but usually do not formally include the need to publish, and so most papers and books are not written by practitioners in industry, even though they make up the majority of HF/E specialists Researchers and practitioners work on different timescales. Research projects tend to be relatively long, and some projects in industry can be very long, but they can also require advice on a topic within a few days or hours. The methods used by practitioners may be very different to those proposed or used by researchers. Typically, practice uses only a fraction of the methods that are published, for a number of reasons associated with accessibility, usability and the context of use more generally. Practitioners and researchers often do carry on separately, but it important that we do not allow a research-practice gap to widen in HF/E. This is important for the relevance and survival of the profession. So how can we adjust to the messy world in which we find ourselves? First, we can reinforce our shared purpose and approach. Human factors and ergonomics has three common threads: 1. It has a systems focus; 2. It is design driven; 3. It aims to improve performance and wellbeing. HF/E is unique in this combination. Sarah Sharples remarked that the late John Wilson‘s office was often messy. She explained that this is the real world of work, and the systems approach acknowledges this, without trying to order it unnecessarily. In the muddle of this complexity often lie patterns, and our expertise as HF/E practitioners is to allow these patterns to emerge. Whatever out filed of practice, we can coalesce around these three threads and they mark us out as a profession. Furthermore, the things which make us unique should help us to be seen as valuable to those who buy our services. According to Margo Fraser and David Caple, we have not done a good job of marketing these unique characteristics to those who could benefit. Erik Hollnagel said that human factors must never forget that it is about work-as-done and not about work-as-imagined. This is the focus of our second suggestion. In his chapter on the Nitty Gritty of Human Factors, Erik Hollnagel remarked that trade-offs are not only an unavoidable part of everyday work – of work-as-done – but they are also indispensable. But he said that whenever human factors engineering has recognised their existence, the response has been to try to prevent them or overcome them. He recommends that we try to understand them better, and to facilitate them, when in the majority of cases they are beneficial rather than harmful. This means we need to hang out in the mess and not try to tidy it up, at least until we have understood it fully. Ironically, we have plenty of trade-offs in our own practice, in the exact same environments. We need to consider ‘work-as-done’ in our own practice. In healthcare, Ken Catchpole and Shelly Jeffcott point out that it is not always possible to conduct work methodically or as planned. In the nuclear industry, Clare Pollard noted that project constraints on aspects such as environment or ageing plant interface design have to be traded off against the safety of the operator and the public. As such, trade-offs and compromises sometimes have to be made to ensure the most appropriate solution for all stakeholders. According to Caroline Sayce and Fiona Bird, in a manufacturing environment flexibility is essential in the application of HF/E good practice and the findings of HF/E assessments to the design, to ensure they are applicable to the operational railway. They said that onerous HF/E requirements can be accommodated but only if they can be justified to have benefit (e.g., operational efficiency, improved safety) within the scope of the project. Talking about HF/E methods in general, Matthew Trigg and Richard Scaife wrote that we as practitioners need to weigh up the result of not doing something against the consequences of doing something but not to the same level of rigour that we would like. Third, we need to engage properly with reflective practice and reflective research. Based on his study of the past and present of human factors and ergonomics, Patrick Waterson observed that we actually know little about how HF/E is practised outside of academia. How is is used in industry and how does it really relate to the wider business context? If we want to know more about HF/E in practice, and indeed about the messy world in general, we need to engage actively in reflective practice. Donald Schön and others have written at about this is a number of contexts, including design, counselling, urban planning and teaching. Schön talks about reflection-in-action – what we might call thinking on our feet. Recall that Technical Rationality breaks down in messy situations. Reflection-in-action, on the other hand, can proceed even in messy situations. So we need to become researchers in the practice context, not totally dependent on established strong theories and inflexible methods. Because each messy situation needs a new theory of sorts. This is not about abandoning research, but rather being pragmatic, collaborative, responsive and reflective. Part of this reflective activity needs to focus on the ethical implications of human factors and ergonomics. Roel van Winsen and Sidney Dekker (@sidneydekkercom), in their chapter on human factors and the ethics of explaining failure, discussed how juridical dicourse uses human factors constructs such as ‘loss of situation awareness’. They argue that this is an ethical problem that we must address. When we unthinkingly use such terms in reports, presentations, discussion and social media – for instance as a ’cause’ of accidents, we may contribute to a loss of liberty of an individual in a messy system, who did not go to work to have an accident. Remember that the driver of the train that crashed at Santiago de Compostela is still facing 80 charges of manslaugter by professional recklessness, over two and a half years after the accident. He is the only person facing charges for an accident with a range of political, economic, societal, technical, industrial and organisational influences. And do we ask ourselves, who or what was protecting this person? And finally we would like to talk about communication, collaboration and inclusivity. Let’s first look at the research-practice collaboration and communication. Don Norman has talked a bit about that. He said that between the two we need a third discipline that can translate between the abstractions of research and the practicalities of practice. Perhaps this needs people who have the opportunity, capability and motivation to do this. But we can all contribute, and research in HF/E should not be so abstract anyway. And let’s revisit for a moment his idea about knowledge in the head and knowledge in the world. Norman talked about knowledge in the world as externalised and contextualised knowledge. So the little protrusions on the ‘f’ and ‘j’ keys on a keyboard are examples. You don’t need to remember where there keys are when touch typing because that knowledge is in the world. If we revisit this concept, how can we get more knowledge into and from the world? We have to rethink our ideas about expertise. Perhaps we can think of our HF/E expertise, including knowledge, as emerging from our relationships and interactions in the world, rather than being in the heads of ‘experts’. There are many different ways we can improve the research-practice relationship. From the chapters on becoming an HF/E practitioner, on doing practitioner-friendly research, on research application and the Afterword, here are some ideas. We need some way of asking questions of those with useful knowledge. A training specialist contacted me from an air navigation service provider to ask about how to handle post-peak workload. What is the state of research? How can I get an answer to this? I can contact friends who know about the state of the workload literature, but how about a Q&A forum where HF/E researchers and practitioners can ask specific questions (not a LinkedIn discussion forum…). More generally, there are other formal and informal ways of working together. Partner up with someone who researches or practices in your area. Let’s get more clear reviews out there. Maybe (as highlighted in the becoming a practitioner chapter) we can organise more crossover roles, sabbaticals, mentoring arrangements, guest lecturing or co-supervision. As most HF/E conference papers are by authors in universities, maybe we could get more practitioner conferences or workshops going, maybe around industry or particular practice themes. Just as we need reflective practice, we need reflective research. It’s important that we realise that we have a foot in two worlds. We have a process world of tools, methods, processes, standards and regulations. And we have a relational world of people. Nothing happens without relationships, even if we have the ‘best’ process. We live in a world connected via relationships. We have to think about relationships not just with clients and end users, but with a much broader range of stakeholders, including judiciary, media, policy makers, regulators, boards, middle managers, allied professions, front-line staff and the public. We have a tradition of working with some of these, as David Antle and Linda Miller noted in their chapter on engaging people in HF/E, but we need to extend our network of relationships to have maximum impact. Here is an example of working with the judiciary, where safety specialists, including human factors, interact with the judiciary, air traffic controllers and pilots to understand each other’s worlds, including the goals and constraints of justice and safety. And there are other examples of working with policy makers and regulators, where various European agencies work together on common safety interests, again including human factors in safety. In all of this, we must reflect on the roles that we take on in human factors and ergonomics. In some situations, we may be more directive, giving specific advice on the goals and method of problem solving, and taking more responsibility for specifying solutions. In other situations, we may be less directive, perhaps observing, asking questions and and reflecting back to the client. In the middle, there is a more balanced, collaborative problem solving relationship. But more specifically, there are particular roles that we may take on, perhaps without realising. We may advocate for the user, or challenge orthodoxy, or evangelise for the aims of HF/E. And we may move between these roles. Role transitions that are not reflective and reflexive may be a source of difficulty. We may slip from facilitator to content expert without awareness, or move between roles out of frustration or pressure. There may also be helpful and unhelpful role combinations, roles that we have not really considered before, and roles that may be better performed by others who have a stake in the goals of HF/E, who are better able to perform those roles. Martin Bromley, in his Foreword to the book, talked about the need to mix it, perhaps transitioning between roles in a reflective way. He believes the most influential HF/E specialists are those who can mix it with front-line staff, CEOs, senior policy makers and even politicians. These role transitions require particular interpersonal and relationship skills. John Wilkinson, talking about human and organisational factors in regulation, said that ongoing partnership and dialogue is important when working with regulators. When it comes to communicating with decision makers, Nigel Heaton and Bernie Catterall talked about the need to be able to communicate in the right way, using language that connects with them and makes it clear how we fit in to the business environment. Don Harris advised that, when writing as an HF/E practitioner, we continually put ourselves in the position of the reader, taking a user-centered writing approach. We saw earlier, from Roel van Winsen and Sidney Dekker, how the concepts we use can have wider implications. Part of this involves the media, who use certain concepts – especially ‘human error – to reinforce particular narratives, involving villains or feckless individuals. We also communicate with the outside world, intentionally or otherwise. Ron Gantt (@rongantt) and I considered HF/E and the media, and we think that HF/E practitioners can help to shape the popular narrative. We have opportunities to anticipate and minimise the negative consequences of media effects on the perceptions of clients and stakeholders, and perhaps take advantage of the rare positive effects. One way is through social media. More generally, considering public engagement and social media, Dom Furniss (@DomFurniss) believes that HF/E needs more outreach and public engagement. This means we need to be more inclusive. Writing about the history of human factors and ergonomics, Patrick Waterson (@PatrickWaterso1) said that rather than drawing lines in the sand and continually arguing about identity and status, HF/E should celebrate what can be achieved by being inclusive. Expertise in systems has to take a multidisciplinary approach, and so it has to come from our interactions, not from out specialisms. So to summarise – in answering the question ‘how do we adapt to the messy world in which we work?’, four themes emerged from the stories of practice which we have curated in the book. First, we must reinforce our shared purpose and approach – coalesce around the common threads of our systems approach, design focus and the joint goals of well-being and performance. This will build us as a community and help show our value outside our community. Second, we must focus on work-as-done, for the people whose work is the focus of ours, and by extension as we reflect on our own practice. This reflection should become part of how we work (point 3); to help us see the messy world in which we work and acknowledge the ways in which we are adapting to it. And finally we must mind how we communicate about HF/E, acknowledging that many outside of our community have a stake and a part to play in HF/E practice, and we can welcome them in through inclusion and collaboration. These four are the themes we highlighted…now we want to hear from you. Slide 57 – Your thoughts? Thank you for being with us. We’d love to hear your thoughts. This entry was posted in Outreach & media and tagged collaboration, HF/E collaboration, outreach, politics, reflective practice, research-practice relationship, social issues, technology, trade-offs. Bookmark the permalink. Just posted at http://www.HFEinPractice.wordpress.com. Human Factors and Ergonomics in Practice: Adjusting to a Messy World: Donald Broadbent Lecture 2016 with Claire Williams at CIEHF Ergonomics and Human Factors 2016.